Go to your blog’s Dashboard and click on ‘Posts’ in the left hand menu. Select a post to edit or click ‘Add new’ to create a new post. Edit or add the information for the post. In the editor place the cursor where you want to add the file link and click on the ‘Add Media’ icon at the top of the editor box. Either upload a file or select one from your Media Library. Once a file is selected click on ‘Insert into post’ to add a link to the file into your post. The text of the link will be the title of your file. This inserts a link to the file at the cursor position. Please be sure that your MP3 file is the first linked file in a post so it gets included in the blog’s feed. Remember to hit the ‘Publish’ or ‘Update’ button to send your post out to your audience. To add an audio player to your post so visitors can listen to your MP3 file see ‘How do I use the ‘Play It Now’ button with MP3 files I have uploaded?‘. How do I use the ‘Play It Now’ button with MP3 files I have uploaded? Classcaster makes it easy to add the ‘Play It Now’ Flash MP3 player to any post on your blog. Just follow the directions below. From the Dashboard click on ‘Plugins’ and verify that the ‘Audio Player’ plugin is activated. to any post at the point where you want the player to appear. When creating or editing a post at the point where you want to insert the audio player select ‘Add Audio’ from the ‘Add media’ bar at the top of the editor. 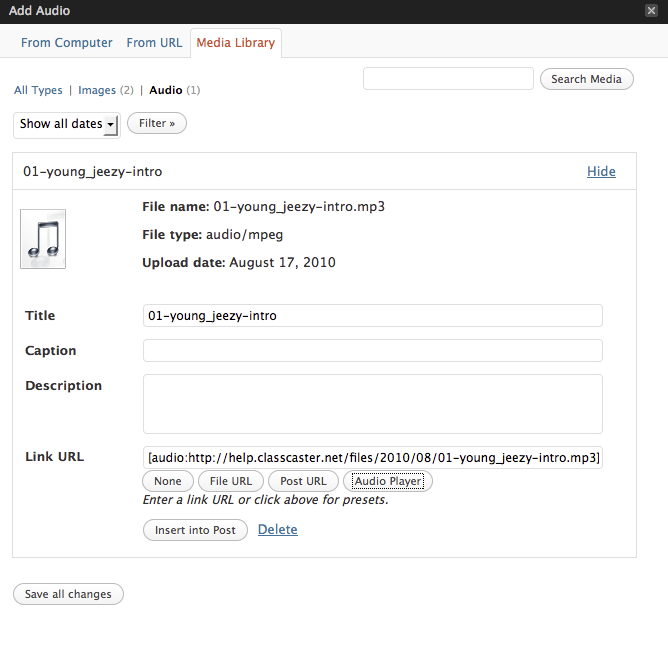 You may either upload a new audio file or choose one from your Media Library. Once an audio file is selected, click on the ‘Audio Player’ button and then the ‘Insert into post’ button to insert the audio player code into your blog post. Once you have added the audio player to your post, you can use the ‘Preview’ button to make sure it is working properly. To add a download link for your MP3 file see “How do I add an MP3 file to my post to create a podcast?”. What file types can I upload to a Classcaster file folder? You can upload most document and media types to your Classcaster Media Library including Microsoft Word, Excel, and PowerPoint files, Wordperfect file, and PDF documents and many audio and video file types. To upload files, please use the directions for uploading MP3 files, but substitute your document files for the MP3s. Be aware that there is a size limit of 256 megabytes for any one given file and 5 gigabytes total upload space. If you need to upload another type of file or if you need to have more storage space just use the form below to let us know. How do I upload my own MP3 files to Classcaster? Go to your blog’s Dashboard and Select ‘Media’ from the left hand menu to open your media library. Click on ‘Add New’ to open the media upload page. Select ‘Select Files’ to add a file to your Library. Use ‘Browse’ to locate the file on your hard drive and click ‘Open’ to upload the file. Note that once you click ‘Open’ the upload happens automatically. Enter a title and brief description of your MP3 in the space provided then click ‘Save all changes’. That’s it. The file is now available in your Media Library and is ready to add to a post on your blog. See ‘How do I add an MP3 file to my post to create a podcast‘ for information on how to include the file in a blog post and create a podcast. This brief video shows you the steps outlined above. How do I record and post a podcast for Classcaster with my telephone? One of the more exciting features of Classcaster is the ability to record podcasts just using your telephone. Every Classcaster blog has this feature, all you need to do to start podcasting is follow these instructions. Login to your blog’s Dashboard. Click on the ‘Plugins’ link on the left hand menu to open the Plugins page. Find the ‘Classcaster Phone Blog’ plugin in the list and click on the ‘Activate’ link. Once the plugin is activate, click on the ‘Settings’, ‘Classcaster Phone Blog Settings’ links to open the plugin settings page. Complete the settings form by filling in your telephone number and selecting a PIN. Please remember these numbers as you will need to enter them to record your podcasts. Add your full name and a topic or topics for your podcast. Your name and the topic will be embedded in the podcast sound file. Finally, enter your CALI/Classcaster password to allow us to verify your account and create draft blog posts for your podcasts. Click ‘Update’ to save this information. You should see a ‘Plugin settings saved.’ message at the top of the page, but the form appear blank. Just click on the ‘Classcaster Phone Blog Settings’ link again and your information should appear. Click on the ‘Settings’ link, then ‘Writing’ on the left hand menu. Under the ‘Remote Publishing’ section check the XML-RPC box and click ‘Save Changes’. This allows the telephone recording system to talk directly to your blog, uploading your podcast and creating a draft post. All done. You have now activated and setup the podcast recording features of Classcaster. From your blog’s Dashboard, click on the ‘Settings’, ‘Classcaster Phone Blog Settings’ links to open the plugin settings page. Dial the phone number in the first paragraph. Yes it is a metro Atlanta area code, so long distance charges may apply. Yes there is only one number at this time, but it has 4 lines, still if you get a busy signal or voicemail just hangup and try again later. Listen carefully to the Classcaster voice menu. When prompted enter the 10 digit phone number you entered in the ‘Classcaster Phone Blog Settings’ page. When prompted enter your PIN. If you mistype any of the numbers the system should prompt you to try again. Once it accepts your phone/PIN combo, you will be prompted to record your message, so just follow the prompts. If you hangup or are disconnected before the recording is finished, don’t worry. The system will save what you have recorded and forward it to the blog . Once Classcaster says good-bye, you may hang up and your recording is posted to your blog as a draft, so no one can see it except you. So, now you’ve done it, recorded a podcast. If everything worked, which I’m sure it did, the recording was transferred to your blog and a draft post was created. Now just a few more steps and you’re ready to share with the world. Login to the Dashboard of your Classcaster blog. Click on the ‘Posts’ link in the left hand menu. You should see a post with a title that begins ‘ A Classcaster podcast for… ‘ that is marked as a Draft. Click on the title to edit the draft post. You can now edit the post, changing the title, text body, etc. NOTE: Do not edit the bottom portion of the post that includes ‘Click here to download…’ line and the ‘Play it now’ code located between the 2 horizontal lines. This allows your students and listeners to have quick access to the podcast. You can also assign the post to categories and add tags to make ti easier to find. When you are done editing the post, click the ‘Publish’ button to publish the podcast to the blog. Surf on over to your Classcaster blog homepage and you should see your new podcast post.